SINGAPORE - Electronic Road Pricing (ERP) rates at some roads and expressways will be reduced while Vehicle Entry Permit (VEP) operating hours will be shortened in line with the December school holidays. The new rates and operating hours will start from Saturday (Nov 21) and last till Dec 31. ERP rates during specified periods will be lowered by as much as $1, the Land Transport Authority (LTA) said in a statement on Monday (Nov 16). 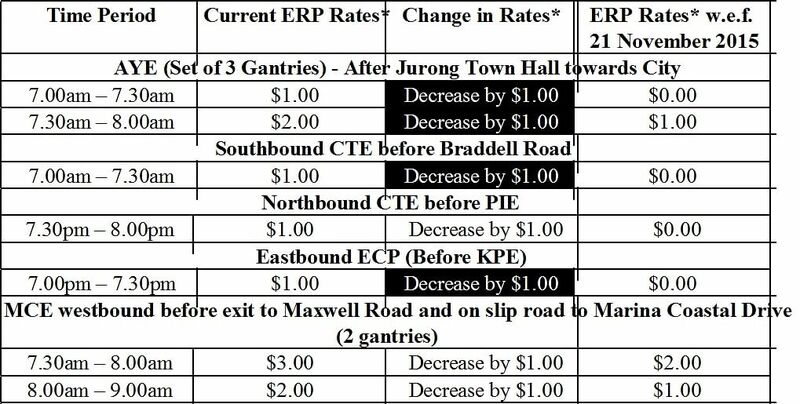 The reduced ERP rates will be introduced at a set of three gantries along the Ayer Rajah Expressway after Jurong Town Hall towards the City, from 7am to 8am. They will also be in effect at gantries at the southbound Central Expressway (CTE) before Braddell Road from 7am to 7.30am and the northbound CTE before the Pan Island Expressway from 7.30pm to 8pm, among others. The ERP rate reduction will be $0.50 on some roads. These include two gantries along Dunearn Road from 8am to 8.30am, and two gantries at Bendemeer Road and Woodsville Tunnel from 7.30am to 8.30am. The rates for other gantries will remain unchanged. The next ERP rate review will take place in February 2016. From Saturday (Nov 21), VEP operating hours will also end earlier at 12pm on weekdays. Drivers of foreign-registered cars and motorcycles will not need to pay VEP fees for the day if they drive into Singapore after 12pm and leave by 2am the following day on weekdays.